Cross-posted at Jezebel and AOL’s Black Voices. In a new book called “The Protest Psychosis: How Schizophrenia became a Black Disease,” psychiatrist and cultural critic Jonathan Metzl draws on a variety of sources — patient records, psychiatric studies, racialized drug advertisements, and popular metaphors for madness — to contend that schizophrenia transformed from being a mostly white, middle-class affliction in the 1950s, to one that identified with blackness, volatility, and civil strife at the height of the Civil Rights movement. The racialized resonance between emerging definitions of schizophrenia and anxieties about black protest seem clear in pharmaceutical advertisements and essays appearing in leading American psychiatric journals during the 1960s and 70s. 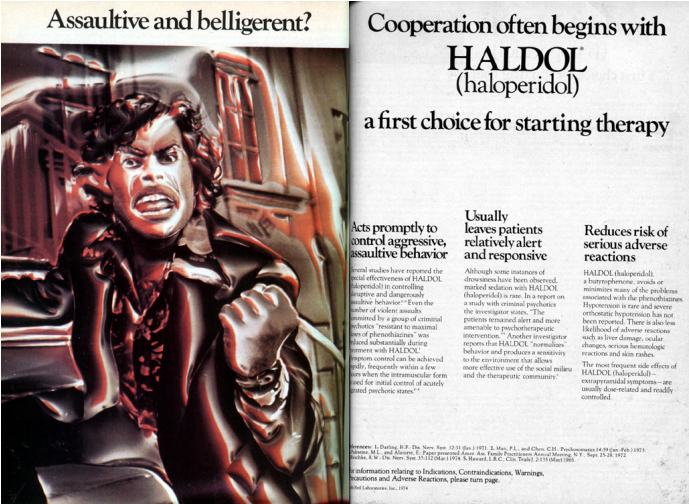 For instance, the advertisement for the major tranquilizer Haldol that ran in the Archives of General Psychiatry shows an angry, hostile African American man with a clenched, inverted, Black Power fist. The deranged black figure literally shakes his fist at the assumed physician viewer, while in the background a burning, urban landscape appears to directly reference the type of civil strive that alarmed many in the “establishment” at that time. The ad compels psychiatrists to conflate black anger as a form of threatening psychosis and mental illness. Indeed the ad seems to play off presumed fears of assaultive and belligerent black men. Moreover, ads for Thorazine and Stelazine during this period often conjured up images of the “unruly” and “primitive” precisely at a time when the demographic composition of this diagnosis was dramatically shifting from a mostly white clientele, to a group of predominately black, confined, mental patients. It is telling that within this context, the makers of Thorazine would choose to portray the drug’s supposed specificity to schizophrenia in their advertisements by displaying a variety of war staffs, walking sticks, and other phallic artifacts from African descent. The below ad for Thorazine, for example, exclaims western medicine’s superiority in treating mental illness with modern pharmaceuticals, by contrasting the primitive tools used by less enlightened cultures. …pharmaceutical advertisements shamelessly called on these long-held racist tropes to promote the message that social “problems” raised by angry black men could be treated at the clinical level, with antipsychotic medications. 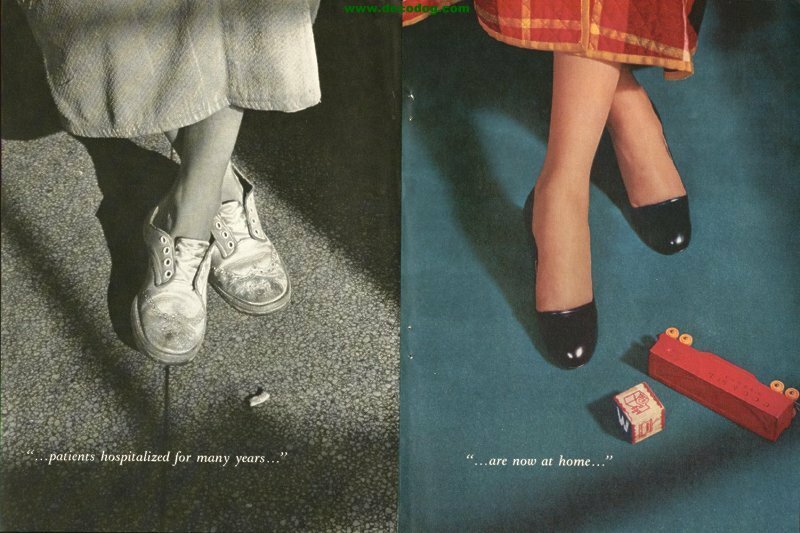 These adds are in sharp contrast to previous marketing campaigns that framed schizophrenia in the 1950s as a mental condition affecting mostly middle class patients, and especially women. Also shown below, ideas of schizophrenia were at that time an amorphous collection of psychotic and neurotic symptoms that were thought to afflict many women who struggled to accept the routines of domesticity. While schizophrenia is certainly a real, frightening, debilitating disease, Metzl reminds us that cultural assumptions of the “other” shape how psychiatry understands and treats the condition. Arturo Baiocchi is a doctoral student in Minnesota interested in issues of mental health, race, and inequality. He is writing his dissertation on how young adults leaving the foster care system understand their mental health needs. He is also a frequent contributor to various Society Pages podcasts and wanted to post something related to a recent interview he did about the racialization of mental illness. If you would like to write a post for Sociological Images, please see our Guidelines for Guest Bloggers. All seriousness aside, I looked at that first image and thought it was a very angry Beethoven in front of a piano, with a window in the background. "Stop acting like we don’t have a right to this collective anger. Anybody with a brain that thinks and eyes that see and nose that knows KNOWS that we have a right to this anger. The “Angry Black Woman” is angry for a multitude of reasons. We’ve been America’s favorite Whipping Girl since the first African woman set her foot in Virginia in the 1600′s. We’re pretty much damned if we do, damned if we don’t. So, the stereotype of “The Angry Black Woman” is rooted in a very visceral truth. We’re tired of this shyt. Stop telling us to stop getting upset. Stop telling us to not be mad despite having to deal with this crap ALL THE TIME. Why are we supposed to put up with this reckless disregard for our humanity with a smile on our face? Because we’re women? Because we’re Black? Please, miss me with that bull. We are HUMAN first. This anger is righteous and all ignoring it and the causes of it will do is create a dyspeptic breeding ground for spiritual, psychological, social and physical dis-ease." I was surprised that the phrase 'How Schizophrenia Became a Black Disease' itself made me do a double take. I'd never inspected how I view a 'stereotypical' person diagnosed with a mental illness. Apparently, for me, the image is white and middle class - either a middle aged woman, or a teenager a-la trainspotting (yes, I know those were addicts, not schizophrenics, but apparently the image translates for me). If I inspect this bias, the images I'm getting are from movies and people posting on the internet who self-identified as receiving mental treatment, even though I certainly didn't know the race or other details about many of the posters. So. Huh. Am I an anomaly in this view, or has the racial picture of schizophrenia shifted back to white people since the 70s? With regards to schizophrenia being a "frightening" disease - That's not really a fair characterization. As with so many things, the media blows violent acts by the mentally ill way out of proportion. The mentally ill are much more likely to be victims of abuse than to commit acts of violence themselves. For every nutjob in a high profile attack, there are thousands who are neglected, abused, and unable to care for themselves due to their illness. That's not frightening unless you're afraid of the homeless. I represented a young black man who had been committed to a crisis unit for 72 hour observation. The psychiatrist wanted to keep him longer, for what, I argued, amounted to his expression of the same type of anger and rhetoric that Malcolm X expressed in the 1960's. Fortunately, the hearing officer agreed, and promptly release my client. Scary. WHEN DID ANGER BECOME MENTAL ILLNESS? This is very interesting because (maybe it's because I am white) I see most mental illnesses/disorders as "white". I have a wide variety of friends from many races/ethnicities/religions, and a vast majority of the people who have told me that they have some sort of mental illness are white. Perhaps it may be that white people more openly talk about mental illness than those of other backgrounds. I am often astounded at how openly someone will disclose that they are bipolar, borderline, etc. It is not that I believe they should be ashamed whatsoever, but the willingness to tell me their medical history before I have even fully remembered their name is a very new phenomenon to me. As one of the posters above noted, when the term "Mental Illness" is mentioned, I get a mental picture of a totally average middle-class suburban white guy with a 9-5 job, who has a breakdown from the excruciating monotony and seemingly meaninglessness of his existence. But hey, to each his own, eh? I'm in NZ, and mental illness here is associated with (in my mind at least) Pakeha (white) people. We are having a lot of advertising about mental illness/depression etc at the moment, and usually Pakeha people are used. We are also having a lot of advertisements about 'lay off the drinking' etc, and its always a Pakeha person with the drinking problem, and a Pacific Island/Maori person trying to support them. Same with anti-violence advertising. I'm pretty sure they are doing this because in the past all these 'bad' characters were represented by Maori/Pacific Islanders in the Media/ads, so there has been a backlash, and now its all Pakeha people. This article is fascinating to me as a white person with mental illness who comes from a white family with a history of mental illness. What I mean to say is, I've always associated mental illness with, well, me and mine. That's not to say I don't also see it as a universal phenomenon; in my time spent in mental hospitals, I've seen the broad range of people mental illness affects. I've also seen the contemporary examples of racialization and gendering of specific mental illnesses: Depression and eating disorders are 'white girl problems', for example, which is insulting to white girls and harmful to everyone else with those disorders. I've also heard the stereotype that schizophrenia is more of a 'black thing', and I wonder if that doesn't have something to do with the high rate of schizoid disorders in the homeless population and the conflation of homelessness and poverty with being of color. I live in Baltimore and do witness much verbally assaultive and belligerent behavior among black men in the community. But it is usually directed at other black men. The percentage of black psychiatrists in 1974 (when the advertisement was produced) was relatively small, compared to the percentage of white psychiatrists. So the advertisement was aimed at white psychiatrists. So I would concur that the advertisement seems to contain the subliminal message aimed at physicians pondering the question of "how can we control these belligerent negroes" rather than the medical question of how to treat PEOPLE with mental difficulties.